20-30 cm. Elegant, exotic and unique. 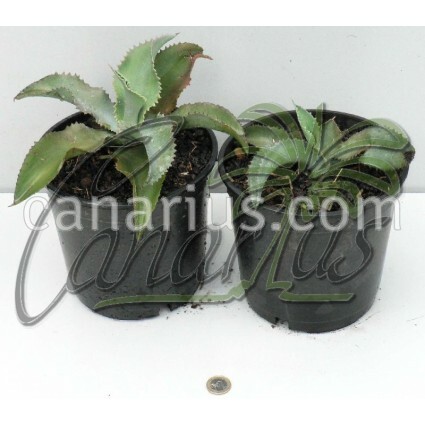 Agave gypsophila has a different shape because of the grey-blue leaves with wavy, undulate leaf margins. Elegant, exotic and unique. Agave gypsophila has a different shape because of the grey-blue leaves with wavy, undulate leaf margins. Adult plants reach 40-60 cm in diameter and produce a 2-3 m tall inflorescence, with yellow flowers. Agave gypsophila is native to gypsum hillsides and calcareous rocky soils, in the Mexican States of Colima, Jalisco, Michoacan and Guerrero. We offer the form initially collected in Tropical Mexico, close to Ciudad Colima, at latitude 19 N. It is a tropical species and must be protected from frost. It should be kept dry when below 10 C. Canarius.com is proud to offer this uncommon species. This plant is 10-12 cm in diameter. We often offer other sizes, you may find them in the catalog. The size of this plant is: 10-12 cm.